For the first time in many years, a Typhoon submarine made a short port call to a base on the Kola Peninsula this weekend. Russian media says next stop is St. Petersburg. “Dmitry Donskoy” has now started the voyage to Kronstadt, 30 kilometers outside St. Petersburg, a source familiar with the case tells Interfax. As previously reported, Russia’s only operating Typhoon submarine will participate in the Navy Parade at Kronstadt outside St. Petersburg on July 30. Before that, «Dmitry Donskoy» will take part in the International Maritime Defense Show taking place in St. Petersburg from June 28 to July 2. It now seems like the voyage towards St. Petersburg has started. A series of images from Saturday show “Dmitry Donskoy” at pier in Okolnaya Bay and in the water outside Severomorsk. The images are taken by photographer Viktor Alekseev in Severomorsk and posted both via twitter and at the blogsite of Oleg Kuleshov, a well-known navy photographer from Severodvinsk. Last week, Kuleshov captured the giant Typhoon submarine when sailing out to the White Sea from her home port. On Monday, Interfax reports that “Dmitry Donskoy” came to Severomorsk on Saturday, May 27. The submarine left Severodvinsk two days before after technical preparations for the voyage to Kronstadt were completed by Zvedockha yard, the navy information portal Flot.com reports. From Severomorsk, the submarine sailed out to the Barents Sea on Saturday. The questions is wheter the course then was set northwest outside the coast of Norway, or if the submarine stays in the Barents Sea before sailing south after entering the Norwegian Sea in the waters outside North Cape. Which course the submarine will take in the Norwegian Sea is unknown, but due to her size, the vessel will have to sail in surface position through Storebælt, the strait between the two Danish islands of Fyn and Sjælland before entering into the Baltic Sea. Also, the Baltics are mostly shallow waters where a Typhoon submarine will have to be at the surface, at least for the most. Never before has a Typhoon class submarine sailed into the Baltic Sea. Most of the voyage takes place outside the coast of Norway. Press spokesperson with the Joint Head Quarters, Major Brynjar Stordal, says to the Barents Observer that it is natural to keep an eye on such voyage. “Naturally, we follow all military activity in our neighborhood, including this one,” Stordal says and points to the fact that Russia in open sources has told that this voyage will take place in the near future. TK-208 «Dmitry Donskoy» is the only remaining Typhoon-class submarine in operation. Six vessels of the 172 meter long giant were originally built to assure the Soviet Union’s ability to respond to a nuclear attack with a powerful retaliation. Carrying 20 missiles and up to 200 nuclear warheads, the sub could stay hidden under the Arctic ice cap and assure a second-strike against the attacker. Nowadays, «Dmitry Donskoy» does not carry nuclear weapons, but serves as a test-platform for the navy and is based in Severodvinsk by the coast of the White Sea. Between 2003 and 2010 a series of 14 new Bulava-missiles were test-launched from the submarine. 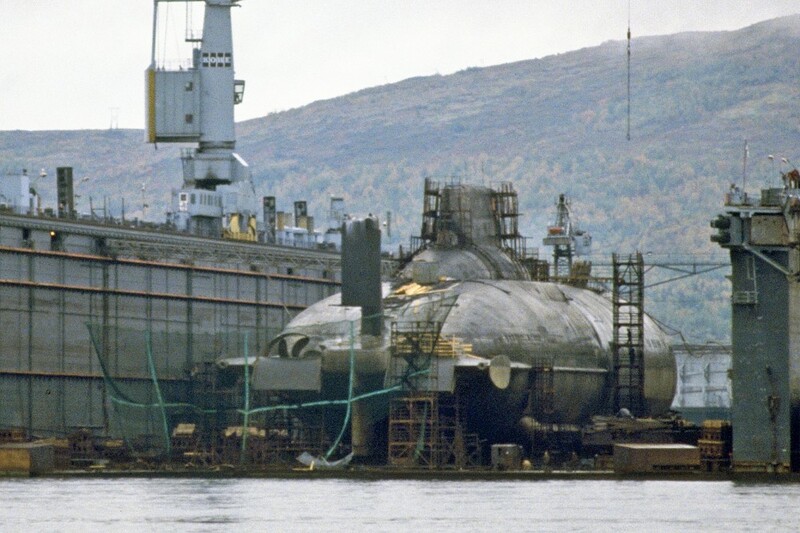 Commissioned in 1981, the submarine is one of the oldest still in operation in the Russian navy. Two 190 MWh reactors powers the steam-turbines providing power to the propellers.